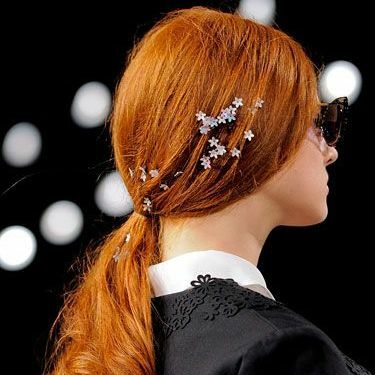 Fashion Week has wrapped up, but let’s talk about our favorite part – the hair! Forget about the high fashion hairstyles you could only dream of doing – this year it was all about trends that are 100% wearable and easy to do yourself. A fresh take on an old classic! It’s not too tricky to style your milkmaid braid like the ones at the Rebecca Minkoff runway. Just braid hair in two pigtails, then wrap each over the top and secure with bobby pins. Runway fashion meets regular girl! The ponytail was due for a major makeover, so we’re happy to see a low, textured version hitting the runways, like at Helmut Lang and Derek Lam. At Honor, they embellished with trendy mini flowers. To get the look, pull back textured hair, then use your favorite flair to give your ‘tail a twist! Beachy waves are going nowhere, as proved on the runways at Diane Von Furstenburg and Alexander Wang. This year it’s soft, loose, and has a natural bend to it – the ultimate lazy-girl’s hairstyle! Just prep with texture spray and twist sections into thin ropes to create a natural bend, and voila – instant chic! And of course, no hairstyle is complete without the perfect hair color! Get a free online consultation from eSalon.com to find your best color recommendations. There’s no obligation, but if you like what you see, their expert colorists will blend an individual hair color just for you (like in a salon), complete with personal instructions and coloring accessories. Then they’ll mail it right to your door for a convenient home application. Get your first custom color kit for only $10 (a 50% savings!) with a satisfaction guarantee or your money back. Go to eSalon.com to get started.